Also suitable for spreading grain and grass seeds at a reduced bout width. Both models available in band spreading configuration. 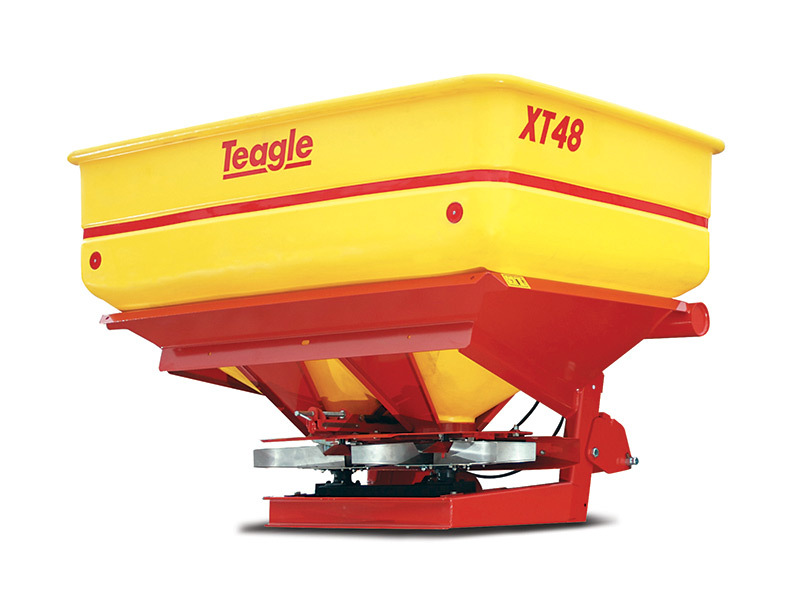 Available for both XT24 and XT48, the band spreading kit is designed for applications such as orchards where fertiliser is required to be spread only in the area to both sides of the machine. Available for the XT48, the high lift legs give an additional spread height of 22cms for top dressing of crops. Available for both XT24 and XT48 models, for either standard or extended hoppers. The hopper cover fits neatly over the top of the hopper for wet weather operation. Available on the XT48 only, a hydraulic ram can be fitted to the tilt bracket to enable it to be operated hydraulically from the tractor seat. One piece hopper extensions are available for both models, extending the XT24 by 150 litres, and the XT48 by 200 litres. The steel extensions bolt onto the top of the plastic hopper and can be removed. A low level sieve is available to minimise blockages caused by lumpy fertiliser. For materials with poor flow characteristics we recommend the powder agitator. Please note this option can not be used when the hopper sieve is fitted.